HomeQueen Bariatric Plus Alternating Pressure Mattress 60"
This Queen size bariatric system provides alternating pressure to optimize pressure redistribution for patients with up to Stage IV pressure ulcers. 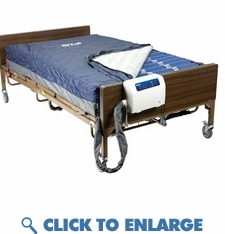 This bariatric mattress can be used in the home, long term care, or acute care setting. We designed this queen size low air mattress for patients that wanted an alternating pressure mattress to fit over their existing queen size box spring. This low air mattress can be used for one individual patient or for two people sharing a bed looking for alternating pressure therapy. Cell-on-cell design of 10" deep air cells prevents "bottoming out" and also provides up to 24 hours of power outage protection. Digital pump allows for customization to individual patients' comfort and safety needs, and will auto-return to alternating pressure mode if system is left on static mode for >2 hours. The digital pump is user friendly, whisper quiet and easy to operate. Patient can easily increase and decrease the firmness and softness of the mattress with a push of a button (10 zone comfort control). The alternating pressure can easily be changed into 4 individual cycles. This allows the patient to control the pressure relief of the mattress changing it from a 10, 15, 20, or 25 minute alternating cycle. Why adjustable cycles? Adjustable cycles can increase the time it takes the mattress to alternate. This allows more time for blood flow to reach the patients body extending the pressure relief therapy. Adjustable cycles are a valuable feature in the treatment and prevention of pressure sores. In addition to the alternating pressure therapy the mattress circulates air flow keeping the patient cool and dry. The Low Air Loss feature is designed to allow the patient to sleep comfortably controlling heat and moisture on the skin. 4-way stretch cover is low sheer, fluid resistant, vapor permeable, quilted and zippered.Each one of the 20, 10" deep air bladders are easily removed and replaced. 3 diagnostic alarms tell you whether a problem is with the mattress or the pump for more efficient servicing.1000 lb weight capacity. Product Name: Queen Bariatric Plus Alternating Pressure Mattress 60"